Earlier this week I wrote a guest post on Sylviane Nuccios site about blogging for ecommerce. The gist of the post was about the importance of building a community when you are blogging. For ecommerce related sites you want to blog to drive traffic to your site and increase awareness. The primary goal though is to generate sales and make more money. Over the years I had always blogged for search engine traffic but not for long term viable relationships. What I mean is, people weren’t coming back to our site to read the blog again. They googled a question, found one of our sites, and hopefully purchased what we were selling at that time. This process is fine and there is nothing wrong with it other than that it’s not long term. It doesn’t build an audience that trusts you, engages with you, or wants to come back. So to sum it up, the post was about building a community while still publishing posts that garner the attention of search engines. But you are here to figure out how to increase engagement and get a better commenting platform. 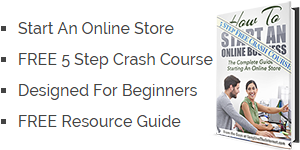 You have heard me preach before about how much I love the Shopify platform for building an online store. They have nailed just about everything. The list of benefits to this platform is endless. On the flip side, there are some problems with Shopify albeit few. One of the main problems with Shopify is their blogging platform. Now I understand that blogging plays second fiddle to their core functionality. After all, they are an ecommerce solution. That aside, they need to improve it. I’m not saying they need to build a platform as robust as WordPress and maybe that’s the idea. Maybe they prefer you host a WordPress blog somewhere else and connect it to your site. Either way, the biggest problem I have with the Shopify blog is their native comment functionality. It’s weak to say the least and I’m probably not being fair. In reality its sufficient. Having used Disqus though on many of my other sites, Shopify comments comes up short. 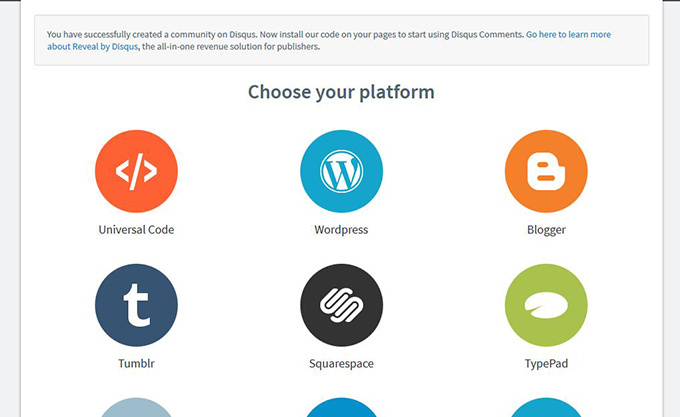 If you haven’t heard of Disqus before, they offer a free commenting solution for your blog. Without going into it in too much detail I have listed some of the amazing features Disqus offers. Higher commenting engagement because users already have an account. I could go on and on but my point is made. 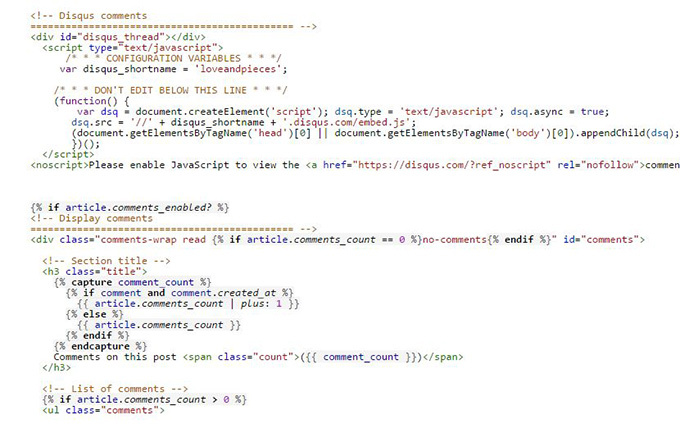 Disqus is a superior commenting platform to Shopifys native commenting in every way. Because of this, I decided a couple of weeks ago that I was going to install Disqus comments on my wifes Shopify site. Apart from this taking time and being another thing on my list of to-dos, there is another consideration. This was the main thing that was holding me back from installing Disqus on Shopify. My wife had over a years worth of posts from every week. Many of them had built up some nice comment history adding credibility to the posts. When I implemented Disqus it was going to completely wipe out all the comments that she had from before. Essentially we would be replacing the native Shopify comments section with the new Disqus one. You can’t exactly copy and past comments over to the new system. HINT: If you are just starting your blog on your online store, incorporate Disqus now and you won’t have the dilemma I had. I suppose I could have left the old comments in some fashion. I would have to disable the add comments part on the Shopify comments. Then I would show the Disqus comments below the old comments. While it would have alleviated the problem, it would make a mess. I have talked a lot about appearance on your online store. I’m not big into messes. It took me about a month to come to terms with the fact that my wife just needed a better solution. There was no way for her to reply to people and have them get the message. What she had just wasn’t working. So the day came and I decided I was going to install Disqus on Shopify. To my surprise this was an incredibly simple feat. What I had built this up, actually took me about 20 minutes to do. 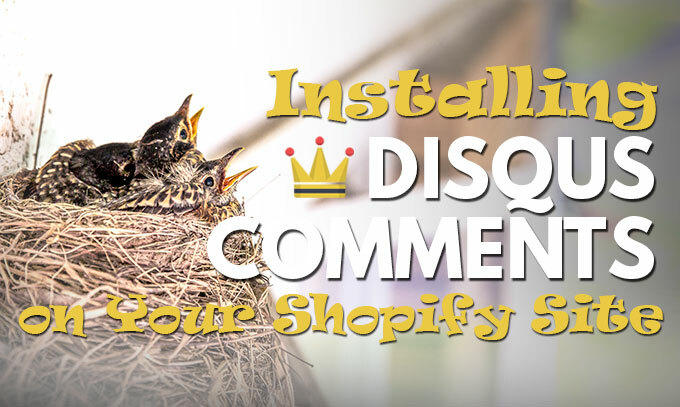 If you are not feeling technical and want to just buy your way out of this problem, there is a Shopify plugin for installing Disqus comments. This is a waste of money. Unless you are afraid of touching any code, I wouldn’t recommend paying for this. You really can figure this out. And if you have trouble or break something, email me and maybe I can help. 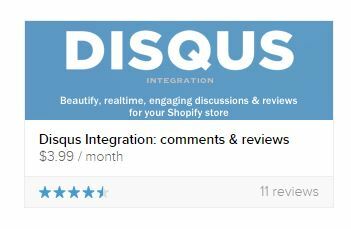 So let me show you step by step how to install Disqus comments on your Shopify site yourself. 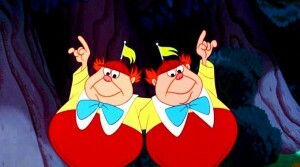 Your first step is to go to www.disqus.com and you are going to look for the link that refers to Publishers. As “Fancy Nancy” says in my daughters book, “Publisher” is fancy for “blog owner”. Click through and look for the button to sign up or start using Engage. Engage is just another confusing name change that doesn’t make sense to me. 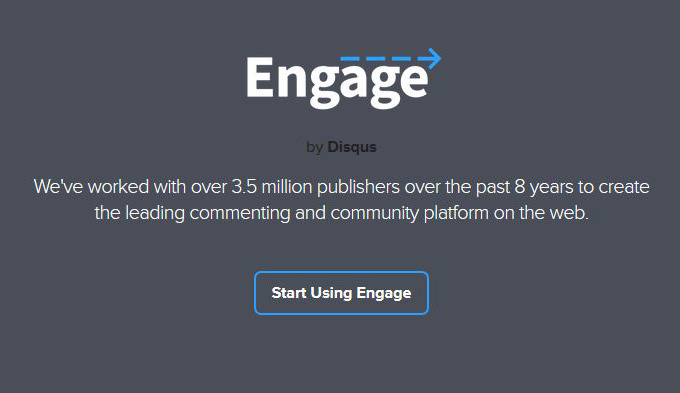 It’s Disqus but for some reason they call the Publisher side Engage. Whatever. Fill out your information and then go to the next step. Here you will fill out information for your site and your URL. Chose something business oriented for your username. The name of your online store would be best. 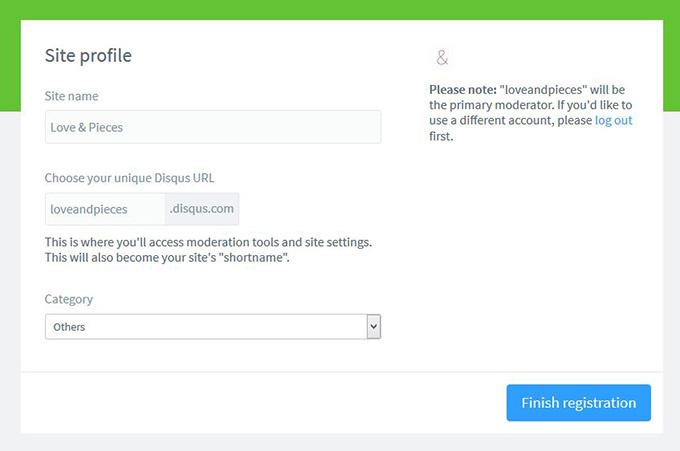 After you have created your account the next screen that comes up shows all the different ways that you can integrate Disqus. Once you select your integration, you will see a window open up with the code for your Disqus comments. You don’t have to understand any of it or change any of it. You are simply going to highlight and copy everything in the window that appears. You can ignore the other more advanced options on the page. All you will need is whats in the box of step 1. Now that you have copied the code, you are going to go to your Shopify site and insert it. You will first want to navigate to the themes section of your Shopify site. Next you will want to click on the three dots and then select Edit HTML from the options. Now is the only tricky part of the whole process. You are going to want to find the page that currently acts as the template for your blog post page. This is the page that handles making each blog post look the way it does. 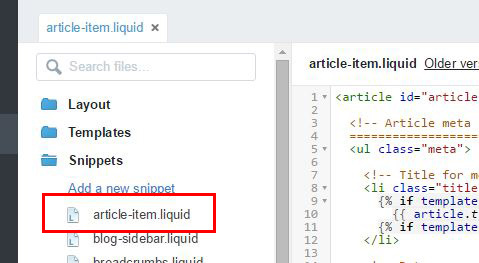 In another one it was called simply article.liquid. You will know you are in the right template because you can skim the content and find the following line. Now that you are on the right page you want to insert the code. I have two different screen shots below showing you two different templates and where the code goes. 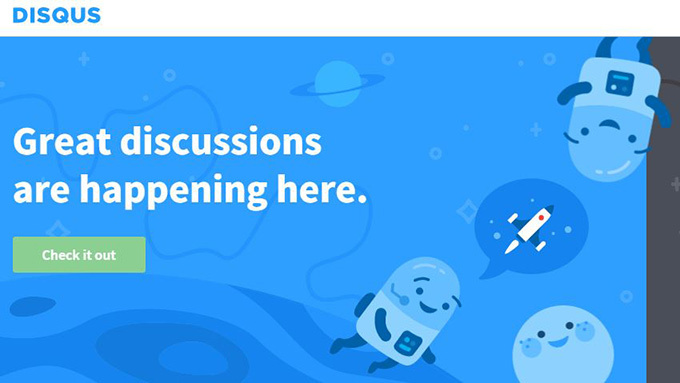 What you are doing at this point is adding the new Disqus comments on top of where the Shopify comments currently appear. You should make sure to paste it on top of the last reference of the IF line that you saw at the bottom of Step 4. Look for the last reference of that line on the page and insert the code above that. Once inserted you will click on save at the top right of the screen. You now have installed the Disqus Comments on your site but, you aren’t done just yet. If you already had the native comments running on your Shopify site, you need to disable them. You don’t want to have both of them running at the same time. On the Online Store tab you will see the option for Blog Posts. This is where you go to write your blogs and moderate your comments. Your are going to select Manage comments and then scroll down to the section where you can disable your comments. 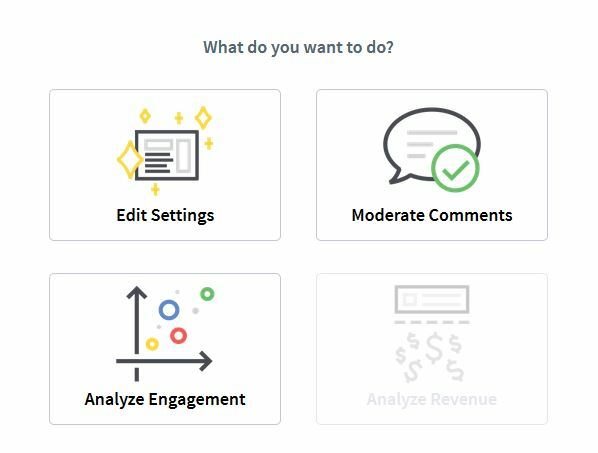 Now that you have your fancy new Disqus comments installed on your Shopify site, you can customize how you want them to work. You will go to your newly created url which is something like yourbusiness.disqus.com. 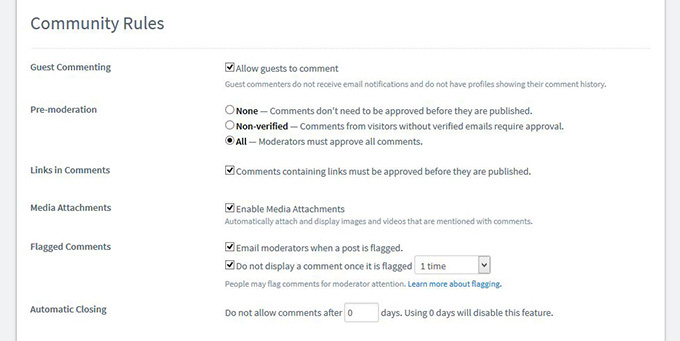 This will be where you moderate your comments and approve them, but you can also customize your settings here. You want to select Edit Settings so you can get in and play around a little. Below are just a couple of the options that you can customize. You can see what I have allowed or disallowed in the settings below. These are just my personal preferences and you can do anything you want here. You made it. You should be able to go back to your blog post and refresh the page and see the Disqus comments section load. Note: It may take a couple of seconds to come up but you will see a spinning wheel. You also shouldn’t be seeing your old comments section. In conclusion, you have now installed a best of breed commenting platform. I promise this is going to increase engagement on your site. We talked about some of the benefits before but you won’t look back. You can expect more comments, less spam, and a better experience even if you are outsourcing your blogging.